During our time in Beijing, our group was fortunate enough to spend part of a day at the Factory 798, a former industrial-turned-artist district in the Chao-yang district of Beijing. Although there is a factory named ‘Factory 798,’ the district is made up of a number of former factories that now house artist studios, exhibitions, shops, cafes, and restaurants. The genesis of the area began when artists moved into the industrial complex after the factories were deemed obsolete and shut down. There have been several attempts by the government and developers, who want to bulldoze the area and put in expensive developments, to shut down the area. Fortunately, such attempts have failed and the 798 zone is thriving. While touring the complex, I came across an exhibition by the artist Wang Du entitled Top Secret-Flying Carpet III. 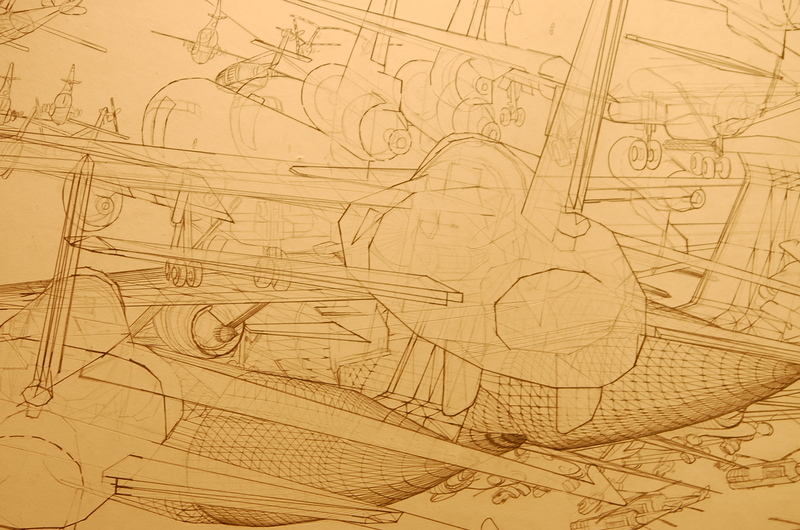 Wang Du employed incredibly complex pencil drawings composed of objects relating to aerospace and the Forbidden City, two entities that seemed completely unrelated to me. The fighter jets depicted in the drawings were incredibly dynamic, their movements sketched over and over again in a progression across the canvas. This movement eventually created one connected motion of the same fighter jet, making it difficult to recognize one full fighter jet by itself. 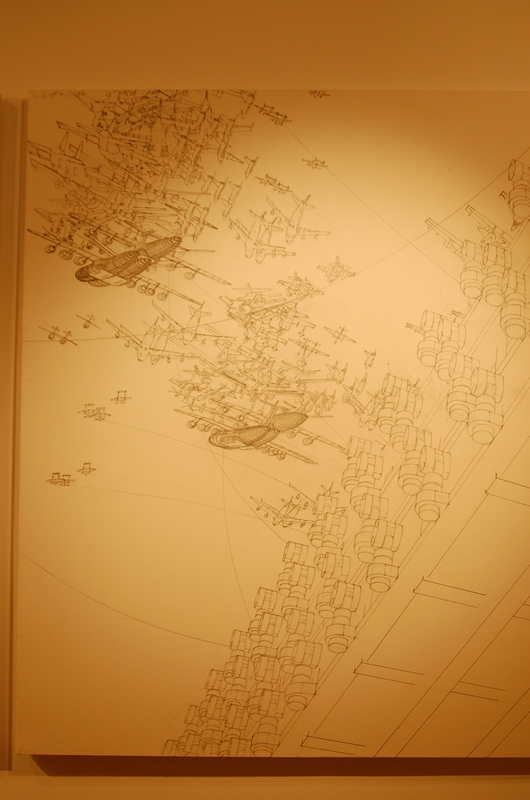 When the aircraft were depicted on the same canvas as the Forbidden City, the two were draw separately, only connected by movement lines that indicated that their movement originated from the city, which seemed to float in space by itself. Wang Du’s pieces caused me to reflect on why he would chose to depict these two unrelated objects and with just pencil, leaving them colorless and in black and white. Much of the contemporary art that I had viewed prior in the day had many colors and their message, critical to say the least, was more clearly viewable. From what I am able to deduce from the Top-Secret gallery is that Wang Du is commenting on the secrecy, and further more the dichotomy imagery, that Beijing possesses. The southern part of Beijing is the location of the country’s aerospace industry. The aerospace industry in China is a state-run military industry and thus a highly top-secret. The secretive nature of the industry has prevented the growth that much of the rest of Beijing has seen in terms of commercial, financial, and residential center growth. Wang Du’s pieces are making a modern-day reference to the days when the Forbidden City was off limits in the manner that the aerospace industry is in present day. Now that the Forbidden City has become a tourist attraction, does this mean that China is finally completely open? No. Instead, in a society that lacks the imperial family, the industry of military technology and government control, has taken its place as the hush-hush medium of the day. Beijing has become a city of black and white, with Factory 798 acting as the grey mediator that allows us to see both sides. If the top-secret aerospace industry of southern Beijing represents the black, then the Olympic Village represents the white. The Olympic Village, located just north of the Forbidden City, is the epitome of the image that Beijing wants to relay to the international community. That much was seen in China’s preparation for the 2008 Olympic Games, where the government would bulldoze entire undesirable areas overnight because they did not want them to be seen. The fact that both the aviation industry and the Olympic Village are both along the north-south axis created by the Forbidden City links them all together. So if this is the scene that the artist has painted for the viewer, what role do areas like Factory 798 play? Factory 798 offers an alternative interpretation of Chinese society in contrast to places like Tiananmen Square, where the Chinese Communist ideology is touted gloriously. 798 offers a glimpse into the grey region that is not commented on by CCTV or read about in the papers. It offers the opportunity for Chinese artists to utilize and showcase their own critical lens of Chinese society when they are unable to do elsewhere without reprisal from the government. We see a similar set up in Shanghai, with the creative industry M50, which is similar to Factory 798, but on a smaller scale. Nevertheless, the soul of the two is the same: expression. In looking at it from an international perspective, one begins to question the presence of such creative industries not only in China, but also in countries like the United States, where there are no political or social boundaries to creativity and expression. Why is there not an abundance of Factory 798‘s and M50‘s in a country that would be completely open to their existence. The creative industry circuit in the U.S. could be accurately described as scattered and decentralized. Artists do not feel the need to gather together and instead rather stand alone. This perception of the individual is where the cultural differences between a nation like the U.S. contrasts to that of China, which is primarily focused on the whole. There is safety in numbers in China and this has resulted in an intriguing and continual growth of places like Factory 798. One might wonder why the Chinese government could even fathom allowing a place where capitalistic creativity and expression can run freely. Yet this is the same government who has advocated the creation of cities like Shenzhen and encouraged the existence of cities like Hong Kong, who utilize capitalism as a means of operation. By implementing contrasting economic operational methodologies, as well as political and social ideologies, China has thus seen a creation of the ‘in-betweens,’ which has been the most fascinating observation as of yet.